Stacy Tilton Reviews: A classy gift for any "Photo Mom"
A classy gift for any "Photo Mom"
I consider myself to be a photographer of sorts...well really I'm a "photo mom" that likes to take pictures of her family so I can scrapbook it later. When you are going to scrapbook photos you take them in a whole different way then other people take photos because you know you will need to be able to tell a story in your layout with them. So that means I take a lot of photos. That also means I like to take my camera pretty much anywhere we go on trips or at practices. And that means carrying a camera bag to protect it. As a mom I want a bag that can hold my camera and it's accessories all together in one safe place. Something I can grab on the go and not have to worry about. And last but not least (for me anyhow) a bag that's compact and easy to toss on my shoulder alongside my purse. I'm not really an all-in-one type of gal when it comes to a camera bag, I prefer something small like the bag in the above photo. 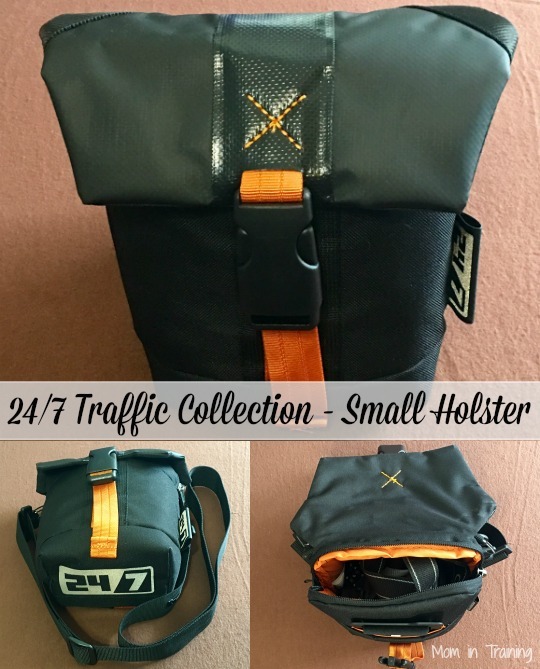 It's called The Holster S (for small) and it's part of the newly launched 24/7 Traffic Collection. I love that it's classy looking so it won't stand out when I'm toting it around. It holds my camera as well as my spare batteries and charger all in the main compartment. It has a front pocket for a spare SD card and an outside pocket where I can put small things. It even has a nice adjustable carrying strap and a built-in all weather cover right in the bottom of the bag. Pretty cool if you happen to be out shooting photos and it starts to rain. Besides this bag there are lots of other great bags in the 24/7 Traffic Collection, so if this seems a bit small for you don't fret they have lots of others to choose from! The Holster M is a medium-sized holster designed for fast-paced city life. It can hold a standard DSLR camera, a memory card and personal items and can be worn either across the body or on the shoulder. The Holster S is similar to the Holster M, but has a more compact size for carrying a mirrorless camera and additional personal items either across the body or over the shoulder. The Messenger S is specially designed for bicyclists looking to carry a standard DSLR kit. It has an additional padded insert to keep equipment from jostling around during a bike ride. The Pouch is designed with extra padding and support to safely hold a superzoom camera. It can be carried on the shoulder or attached to a belt for free-hand shooting. The Shoulder is created for commuting photographers looking for style and discretion with a little extra space. It fits a standard DSLR kit as well as any equipment necessary for a full day of shooting. The Sling is designed to give shooters ultimate flexibility on the job. It offers side access to take the camera out without removing the bag – making gear accessible in a flash.